The black phoebe is predominantly black with a white belly. The Pacific County Checklist of birds has various abundance categories. One of them is rare which means that less than five records exist for the bird. This is the case for the black phoebe. It is considered rare in the county. The field checklist of birds for the Willapa National Wildlife Refuge indicates that there are zero sightings there. 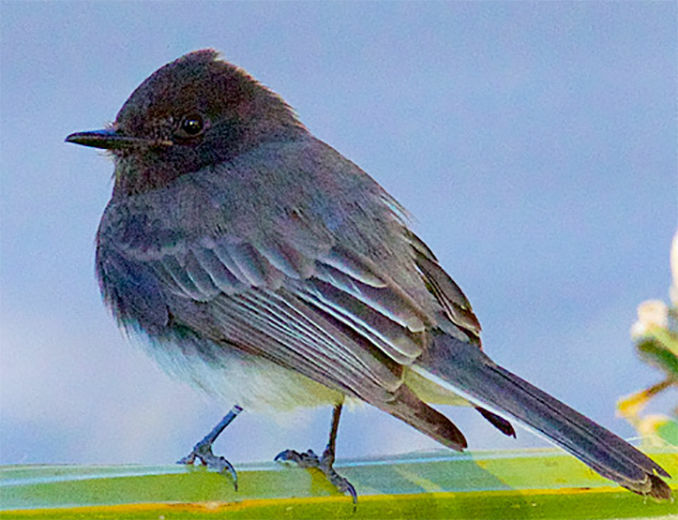 The black phoebe has been seen at the Julia Butler Hansen Refuge for the Columbian White-tailed Deer, but is considered rare in spring and summer. This means that for JBH we should see it at intervals of two to five years. On March 1 three of us were bird watching at Tarlatt of the South Bay Unit on our way to clean the observation blind. The weather was sunny and fairly warm. The birding was awesome. Wilson’s snipe, American robins, three American kestrel, a red-tailed hawk and numerous waterfowl were among the species we recorded. We arrived at the blind and opened the viewing windows. Cameras were placed on the sills and were at the ready for any bird species that came into view. This surprise and unexpected sighting was a black phoebe, which is a member of the flycatcher family. It is a first for the Willapa National Wildlife Refuge and the Peninsula. Scientists report that although it is generally a species of the Southwest, it has been steadily expanding north into Oregon and Washington (Shewey and Blount, 2018). More specifically, it is known to breed from southwest Oregon and California through Central and South America. Confirmation of nesting by at least one pair of black phoebes for the Julia Butler Hansen Refuge has been recorded. Phoebes rely on human built structures such as buildings and bridges for nesting sites. It makes an open cup nest, which is placed under a cliff or a bridge and cemented in its place with mud. It lives in a variety of habitats but is always near water. Tarlatt has a kiosk. Perhaps it will select it as a place to put its nest. Its nesting needs are very similar to those of the barn swallow, but it may use the same nest year after year. The black phoebe is mainly insectivorous and waits on a perch before flying out and catching its prey in the air. It will “hawk” mainly over water but often lands on the ground to graze on insects. Among its favorite are wasps, bees, grasshoppers, damselflies, dragonflies, beetles and spiders. In addition, it may grab small minnows from the water’s surface. Black phoebes are monogamous. The male will select a few nesting sites by hovering over a likely spot and show them to his mate. She will make the final decision and will construct the nest herself (Cornell Ornithological Lab). The black phoebe is a very exciting find, and don’t forget, it is a first for the refuge and the Peninsula. This energetic, acrobatic bird can be very entertaining as it swoops off its perch, grabs an insect and returns to its perch to start all over again. Look for them at Tarlatt or near other water sources such as small streams or sloughs. So with cameras poised photos were taken, but alas they all turned out to be only good enough as a record shot because the phoebe was quite a distance from the blind. However, I did see a black phoebe in Baja California, Mexico — so it’s here for you to see!